When Disney bought Lucasfilm in 2012 for more than $4 billion, we all knew that they had big plans, but those plans have turned out to be perhaps even bigger than most of us imagined. Not only are we going to be getting a brand new Star Wars movie every year from now until it somehow becomes not profitable, but they are currently working on a massive expansion to their theme parks that will be based in a galaxy far far away. We don't know a whole lot about what to expect, but today we finally got a new glimpse of what is in store for fans in the not too distant future. Thanks to a post that recently surfaced on the Disney Parks Blog, a brand new piece of concept art for the upcoming Star Wars land expansion has been revealed. Disney initially broke ground on the project in April, these expansions at both Disneyland and Disney World represent the largest single expansion in the history of the parks. We now know that Disney is using that space to make a brand new, never before seen world within the Star Wars universe that fans will be able to immerse themselves in, and from what we can see, it looks pretty great. "Nestled between towering spires of rock, this thriving port contains a seemingly familiar architecture of markets, landing zones and buildings...Look closely and you may find hints of some of the thrilling experiences that are coming - like the Millennium Falcon peeking out of one of the cargo bays, marking the location where guests will get the opportunity to pilot the fastest hunk of junk in the galaxy." The art itself is currently featured at Frontierland along Big Thunder Trail at the parks, which is where one of the entrances to the new Star Wars land will be. The art itself looks like it was ripped right out of a concept art book for one of the movies and though it is a new, unnamed planet, it looks very familiar. An X-Wing is prominently featured flying into what looks to be a Rebel base of sorts. There are lots of various buildings that will likely house the various attractions this new Star Wars land will feature. But without question the most tantalizing bit is the Millennium Falcon. We learned during a Disney anniversary special that aired on ABC earlier this year that one of the main attractions at this Star Wars theme park expansion would be a full-scale version of the Falcon that visitors will be able to check out. Patrons will be able to walk around the ship, get hands on with it and most importantly, be able to fly it. Sort of. Obviously it will be a flight simulation, because it's a ride and not a real spaceship. But that is close enough for most of us and with the detail it looks like Disney is putting into the expansion, it should be closer to the real thing than any of us ever expected to get. We still don't know exactly when the expansion will be open to the public, but this gives us a slightly better idea what we can expect with it finally does. Disney has a long standing history with Star Wars themed attractions at their parks, dating back to Star Tours, which opened in 1987. Now that Disney owns all of Star Wars, it is all fair game and it looks like they are taking full advantage for the fans benefit. 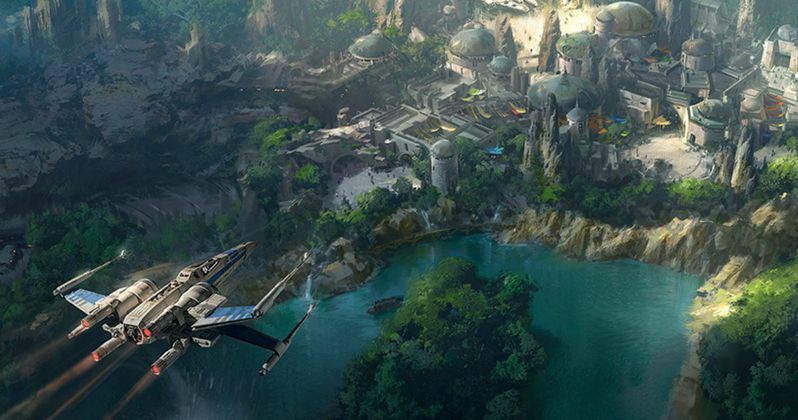 Be sure to check out the new concept art for the Star Wars land Disney Parks expansion below.